Greetings, readers! My name is Patrick Conraads, and I just finished my first year as a graduate student in History at the University of Wyoming. This past semester, I was enrolled in Rick Ewig’s Archival Methods class. For my term paper this semester, I wrote a paper about McCarthyism during the Cold War and Adrian Scott, who was a member of the Hollywood Ten. The Hollywood Ten were indicted on charges of communism, and Scott was jailed in Kentucky for a year because of charges of communism. 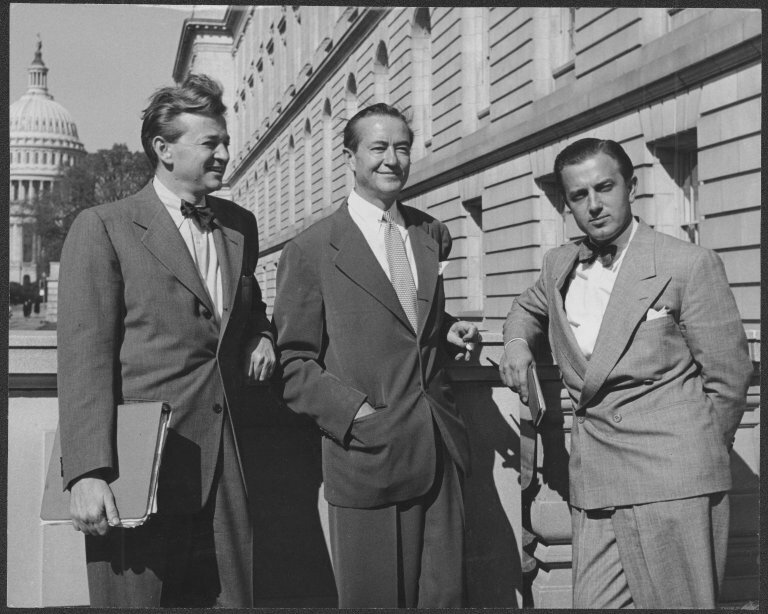 Adrian Scott, Bartley Crum, and Edward Dmytryk outside of a building in Washington, D.C. Adrian and Joan Scott Papers, Collection #3238, Box 2, Folder 21. UW American Heritage Center. We must see to it that the Four Freedoms and the Atlantic Charter are realities – and not catchwords of a dying liberal thought. We must see a forthright renewal of the attempt to establish equality for minorities. We must, in short, see to it that the progressive tradition – whether at home or abroad, in the office or in the home – must follow the architectural framework we inherited from Franklin Roosevelt. Scott intentions were not to be un-American, but to carry on with political thoughts that had been rendered obsolete by World War II. The fact that men have the right to speak or write as they please does not exempt their speech or writing from your field of inquiry. It is not criminal, for instance, for any man tor group of men to advocate the granting of patents of nobility, or the creation of a state established church, or the disenfranchisement of citizens because of creed, or the abolition of the right to private property, but it would be deeply un-American for them to do so. Mundt used Davis’ comments as guidelines for what the House Committee on Un-American Activities needed to do. Mundt told Congress “our task, top which the house assigned us, is to seek out and to expose those activities, which although legal, are none the less un-American, subversive and contrary to the American concept.” Mundt’s speech made it clear that the Committee could pursue un-American activity even if it was legal. The Adrian and Joan Scott papers contains over one hundred boxes, consisting of scripts, correspondence, speeches, and the Mundt-Nixon Bill. The collection provides insight into what Scott believed, and how his beliefs were evident in some of his films. A researcher can get a great understanding of how America feared communism when they combine this collection with the nuclear anxieties of the Cold War. This research has been fascinating, because it shows how America increased censorship in the name of security during the Cold War. Taken from the last page of a speech given by Adrian Scott in Folder 2, Box 1 Adrian Scott Collection, #3238, American Heritage Center, Universtiy of Wyoming. The speech is to various members of the Hollywood ten and Blacklist 19, speaking to their courage, their political beliefs, and how they are being singled out by the House Committee on Un-American Activities. This quote comes from the last page of the speech. Taken from section two of the Mundt Nixon Bill in Folder 1, Box 1, Adrian Scott Collection, #3238, American Heritage Center, Universtiy of Wyoming. The bill outlines the necessity for legislation, villainizing communism along the way. There are a total of 11 reasons given for action against communism. The overall theme is that Communism will destroy the capitalist order. Taken from page 24 of a report on Karl E. Mundt and his congressional history. Folder 1, Box1, Adrian Scott Collection, #3238, American Heritage Center, Universtiy of Wyoming. This entry was posted in Cold War, Hollywood Ten, Student projects and tagged Archival Methods Course, Hollywood Ten, McCarthyism. Bookmark the permalink.